Discussion in 'Online Games - News and Reviews' started by Kotsy, Jul 6, 2013.
the online casino industry. The game was launched in 2013 and is available in two versions – for computers (as part of the Slots3TM library) and for mobile devices (as part of the ToGoTM library). There is a lot happening in the game; when the theme is fireworks it is only natural to expect the spectacular, and the game delivers completely on this front. The visuals are spectacular and there are interesting features for players to benefit from as well. The minimum coin value is €/$0.02 and the maximum is €/$0.50, and you can bet a maximum of 10 coins per line, which makes this a great game for both beginners as well as the big money players. of paylines and coins per line, the easiest thing to do is to hit the Max Spin button. Your balance, credits, and wins if any are displayed on the screen. computer or from your mobile device. you can hit a winning combination on the reels in both directions – from left to right or from right to left. And when this is across all 10 paylines, you are looking at doubling your payouts, as simple as that. The game also comes with a maximum jackpot of 25,000 coins across all 10 paylines, or 2,500 per line. That means a shot at a great win every time you play this exciting slot from BetSoftGaming. Expanding Wild symbol, which is the crate firework. you have a shot at additional re-spins during the free spin round provided another wild appears on the additional rounds. which means a maximum of three free spins. in Boomanji is the three fireworks icon. Other icons that can trigger big payouts include mega boom and the turbo bomb. The maximum jackpot of 25,000 coins is possible with the three fireworks symbol. The simultaneous launch of Boomanji on the desktop as well as mobile libraries (Slots3TM and ToGoTM respectively) means you can now also play this game on your mobile device. You can play this game on your iPhone, iPad, or Android device. The same bonuses and wild cards are available in the mobile version as well. 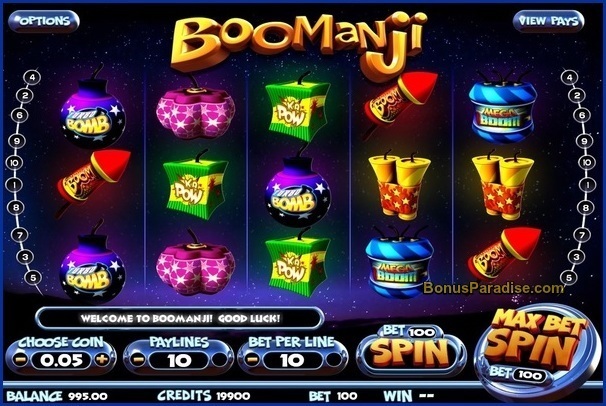 Play Boomanji Video Slot at Vera&John Casino via your desktop or mobile device! Good luck if you plan to give Boomanji a try. What a great Review Kotsy! Im sure going to try out this nice slot!